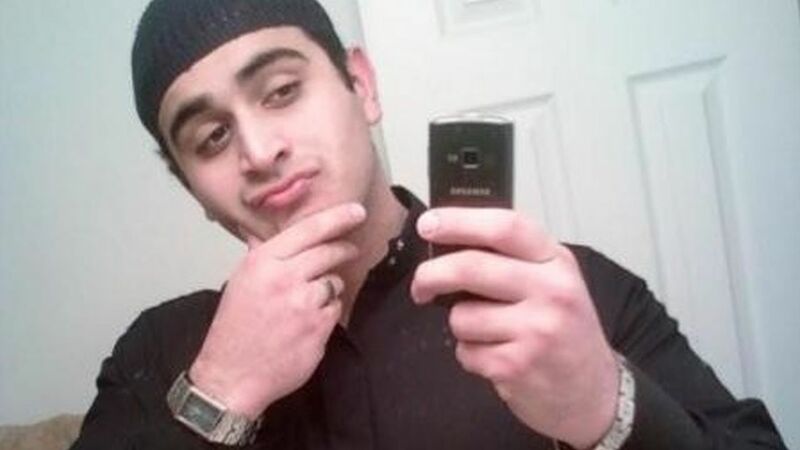 ORLANDO, Florida (WABC) -- Omar Mateen called 911 to pledge his allegiance to ISIS after the shooting at an Orlando nightclub began, two separate law enforcement officials confirm to ABC News. Some law enforcement sources had previously characterized Mateen, 29, as having sympathy for, or ties to Islamic terrorism. Multiple law enforcement sources tell ABC News, Mateen was a U.S. born citizen who lived in St Lucie County, Florida. Mateen's parents were born in Afghanistan, officials said. He was born in New Hyde Park, Queens, but officials said there is no evidence he has been in New York City recently. He was believed to be living with his sister and her husband in Florida. Mateen had two firearms licenses, a security officer license and a statewide firearms license, all expiring in September 2017. His father said he is "in shock like the whole country." He says he wasn't aware of anything his son might have been planning. Mir Seddique told NBC News that his son got angry when he saw two men kissing in Miami a couple of months ago and thinks that may be related to the shooting. He says it has nothing to do with religion. Speaking to reporters Monday morning, Mir Seddique said the attack was against his principles and against what he taught his son. He said the family is shocked by what happened and that if he'd known what his son was planning, he would have arrested him himself. Mateen took hostages and opened fire inside a crowded gay nightclub in Orlando, Florida, early Sunday morning, killing 49 people and wounding 53 others before SWAT officers killed him, authorities said. Law enforcement sources say the Orlando shooter used 30 round capacity magazines with his AR-15 rifle, at least some of which were configured with two magazines taped together allowing the shooter to reload quickly by popping the expended magazine, flipping it over and inserting the fresh magazine. No higher capacity drum style magazines have been recovered so far, sources say. It is unclear how many rounds were expended. Earlier, FBI assistant agent in charge of the agency's Tampa division, Ron Hopper, said investigators are "looking at all angles right now" to find a motive. "We do have suggestions that that individual may have leanings towards that, that particular ideology (Islamic extremism). But right now we can't say definitively, so we're still running everything around," he said. Mateen attended evening prayer services at the Islamic Center in Fort Pierce three to four times a week, most recently with his young son, said Imam Syed Shafeeq Rahman. Although he was not very social, he also showed no signs of violence, Rahman said. He said he last saw Mateen on Friday. "When he finished prayer he would just leave," Rahman told The Associated Press. "He would not socialize with anybody. He would be quiet. He would be very peaceful." He was also bipolar, Mateen's ex-wife, Sitora Yusufiy, told reporters in Boulder, Colorado. "He was mentally unstable and mentally ill," Yusufiy said. Although records show the couple didn't divorce for two years after the marriage, Yusiufiy said she was actually only with Mateen for four months because he was abusive. She said he would not let her speak to her family and that family members had to come and literally pull her out of his arms. FBI agent Ron Hopper revealed that Mateen was interviewed three times between 2013 and 2014. Mateen was interviewed twice in 2013 when he made inflammatory comments to his co-workers alleging possible ties to terror. The case was closed after records checks, interviews and physical surveillance were not able to substantiate the comments. In 2014, the FBI interviews Mateen once more following possible ties to American suicide bomber Moner Abu-Salha. It was determined that the contact was minimal and the case was closed. ATF officials also confirmed that Mateen purchased the firearms used in Sunday's attacks within the last week. The weapons were purchased legally. Interviews with Mateen's family are ongoing, Hopper told ABC News.